I wasn't always Pearl North. That's right. It's not my real name. 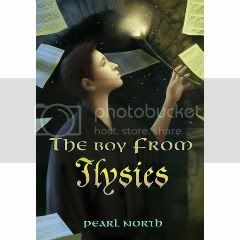 I'm really Anne Harris and I wrote three science fiction novels for adults before turning to YA and adopting the pen name Pearl North. People tend to have a lot of questions about this. Why did I take on a pseudonym? Why did I switch to YA? And the question I get the most: How did you come up with the name Pearl North? As to why I started writing YA, that was a total gimme. I've always had adolescent characters in my books, frequently as main characters, and when I decided to write a book about a teenage girl living in a library so vast people sometimes get lost in it and never come out again, well, that was an idea that pretty much screamed YA to me, and my editor agreed. It was at that point that he asked me if I'd be willing to take on a pseudonym, and the reason is pretty unglamorous. The unvarnished truth is that after three sf novels with successively decreasing sales, I was officially in what is known as the dreaded Death Spiral. This is a thing that happens where your first book comes out and everybody's really jazzed about it and the buyers for the book stores buy x number of copies for each store and something like x-2 copies sell. Well, when your next book comes out, that buyer only orders x-2 copies, and there's some unwritten law of the universe that one or two copies of a book always go unsold. So your second books sells x-2-2 copies, and then your third book comes out and the buyers order x-2-2... You see where this is going. So the whole point of taking on a pseud for my YA books was to do an end-run around the Death Spiral and get Libyrinth ordered as if it were a promising debut novel by a new YA author. Ahem. I'm happy to say it appears to have worked. As to the origins of Pearl North, here's what happened. There was a delay between the time when my editor said he would buy the Libyrinth books -- and he insisted it be a trilogy, not the single novel I'd originally planned -- and when the contract actually arrived. When it did come, I was on vacation in Northern Michigan, at my favorite place in the whole world, Pearl Lake. My agent called with the news, and she needed my pseudonym for the contract, so I had to decide on something in like, an hour. All I could think of was that I was up north, at Pearl Lake. And that's how Pearl North came into being. Libyrinth came out in 2009, The Boy From Ilysies just came out Nov. 9 of this year, and the third Libyrinth book, The Book of the Night, is forthcoming in 2011.